Sahaja Yoga Meditation is a method of achieving a unique state of awareness through the awakening of our innate spiritual energy (Kundalini). This state, known as thoughtless awareness, makes us peaceful, balanced and integrated while improving our wellness and relationships over time. 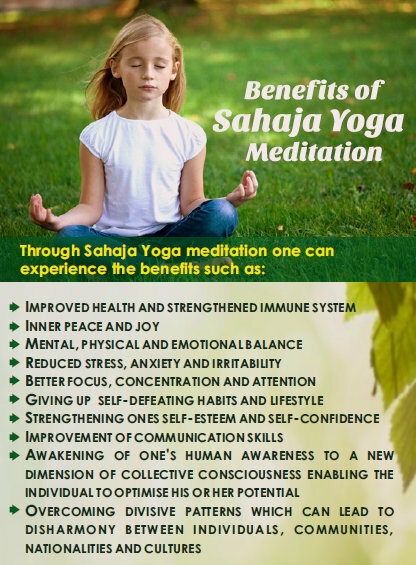 What are benefits of Sahaja Meditation? Sahaja Yoga Meditation can unleash your potential for good mental and physical health and maximum performance, and help you to live fully in the present moment. How is Sahaja Meditation different from other forms of meditation? While most other forms of meditation focus on temporary or short-term benefits of stress relief Sahaja Yoga Meditation benefits include more permanent, positive trait changes in your life, enhanced well-being, improved relationships and a resilient, dynamic, balanced and peaceful personality. Further, the experience of thoughtless awareness is established on a plane of consciousness higher than the mental plane, another unique difference when compared to other forms of meditation. And practicing Sahaja Yoga is truly and genuinely free.